1. Without guide lines, more wide usage. Without Scale Lines: It doesn't effect the monitor when you want it worked full time. 1 or more can be installed on vehicle blind position, you can catch all the blind spots when driving on road. High Definition Image: Sharp color CMOS sensor; 420 TV lines; 648 X 488 pixels; HD clear picture; Bright color contrast. Auto IR Cut Night Vision: Built-in 18 IR LED lights, good performace in day and night. Automatically switches to IR when light level is low. Night visible range to 30ft. IP68 Waterproof: High strength weatherproof lens. Has a glass window on the front that is sealed to protect camera when raining or snowing. 120 degree wide viewing angle. 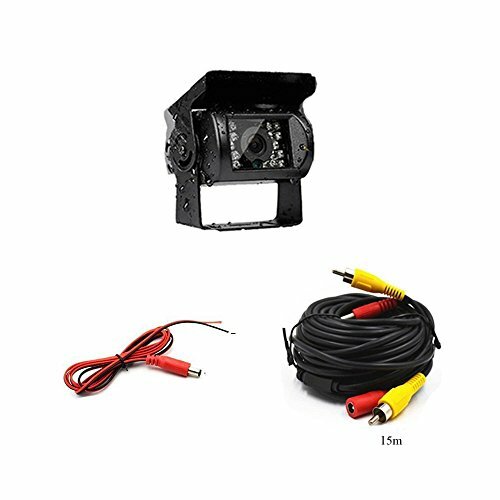 Package Included: 1 x Car Rearview Camera, 1 x 49.2 ft RCA cable. Suitable for RV/Motorhome/Bus/Lorry/Trucks/Vans, an indispensable part of car backup system.